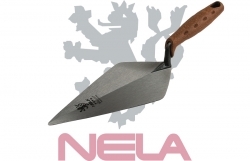 The range of London brick trowels from NeLa are made in Germany, using High quality Steel. The trowels are fully forged allowing for High strength and durability. NeLa Narrow London Trowel 10"
NeLa Narrow London Trowel 11"
NeLa Wide London Trowel 10"
NeLa Wide London Trowel 11"
NeLa Wide London Trowel 12"